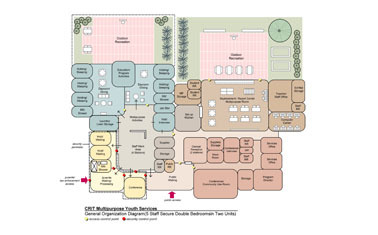 In developing a Master Plan, JSG conducts intensive interactive workshops with the client planning team to (1) develop a vision, philosophy and mission for the new facility; (2) define the facility functional requirements including users, hours of use and communication and security requirements; (3) define facility space requirements including numbers and types of spaces, architectural and engineering characteristics, and special relationships; and (4) develop concept-driven capital and operating cost estimates for the proposed project. Our role is to assist the client in this endeavor by working with the project team to create a thoughtful, comprehensive plan that defines facility objectives and requirements, develops an appropriate response, and documents the related costs. Owners must be sensitive to many factors in siting new juvenile detention or correctional facilities. This is critical both to meet legal requirements and to maintain positive relations with the communities in which new facilities will operate. Depending on the jurisdiction, land use clearance may be an informal process of obtaining public approval or a formal process of submitting data and justifications for review and approval. JSG is experienced in working with owners to complete both processes. In this capacity we conduct demographic studies on population distribution, study the nature and density of similar facilities proximate to proposed sites, meeting with State and County officials and attending public hearings in working with jurisdictions to obtain clearance for a proposed site.